All tombstones in Woodlawn Cemetery were photographed by Bob Glover between Jan 1, 2015 and present. NOTE: Rows listed are not official; rows are not consistently arranged. A. Large loop in the middle of the cemetery bordered by the paved road. B. Left side between the elementary school and the paved road, up to the border of Sec C. The borderline is between the William and Betty Woodworth stone to the left (Sec B) and the Vinton and Mary Lou Wightman stone to the right (Sec C). The red shack between the school and playground is the sight line for the border. 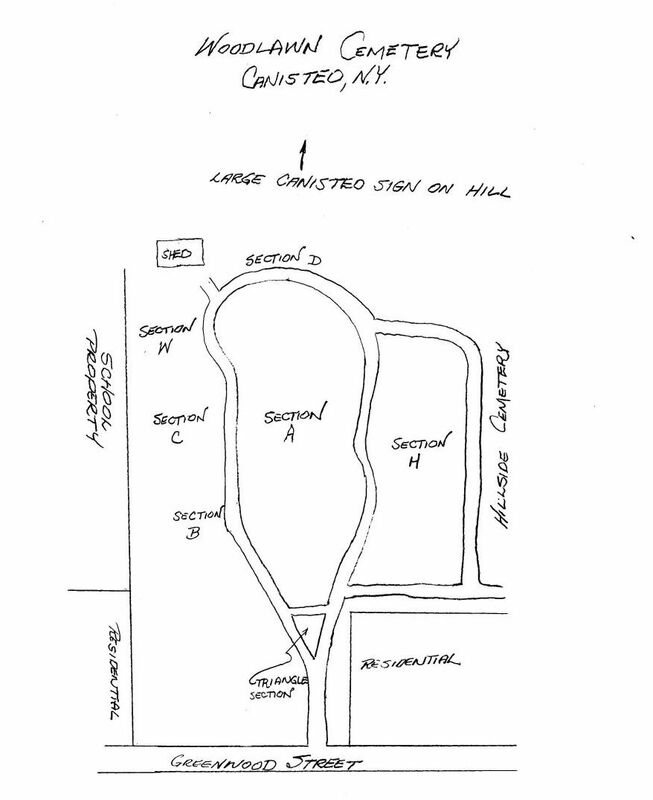 C. Left side between the elementary school/tennis courts and the paved road, above the border to Sec B, and below the raised Sec W.
D. Along the upper wood line from Feenaughty to Hallett stones; ends just after the break in the paved road above Sec H; borders the lower section of Hillside Cemetery. H. Loop bordered by the paved and dirt roads, between the Sec A loop and the lower section of Hillside Cemetery. W. Raised area above Sec C, below the white shed. TRIANGLE. Triangle at the entrance to the cemetery. NOTE: This list is from gravestone readings, enhanced by information from obituaries and other sources. It is not an official record of the cemetery. This is a work in progress. There were burials made over time with no tombstones, and there were some that disappeared. 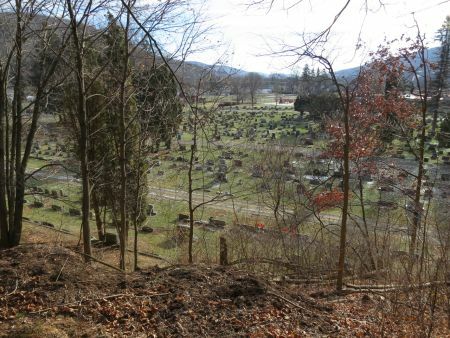 If a person is listed in an obituary for this cemetery but no stone is found, we list them here. If there is no stone or obituary documenting burial here but it was highly like the person was buried at this cemetery, it is so noted. In some cases obituaries have listed the wrong cemetery. In some cases a person was buried in one cemetery and later moved to another. STEPHENS, Samuel A. , spouse of Ella Dickinson , Born Dec 1842 , Died 28 Apr 1915 s/o Benjamin and Lydia Root Stephens; Sec A-3; Civil War Bat. L. 3d Reg. N.Y. V.